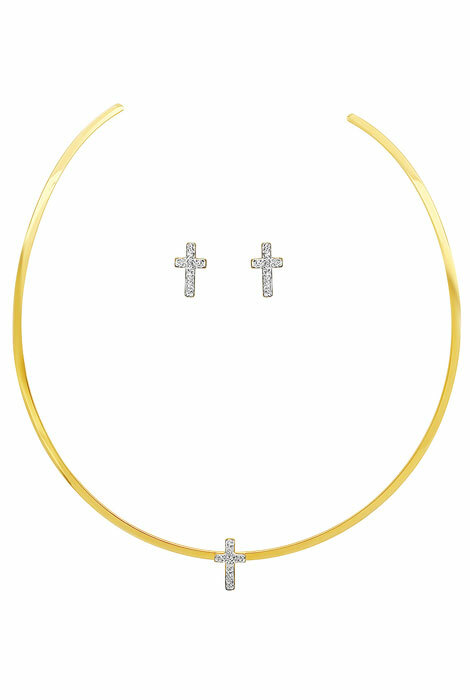 Faithfully fashionable CZ cross earring and collar necklace set features a collar-style necklace with cross pendant to complement any neckline — lies perfectly in place over bare skin or clothing. 3/4” H cross post earrings are beautiful with necklace or alone. Made from 18k gold-plated stainless steel, a quality choice in jewelry design because of its beautifully polished finish, durability, and resistance to rust, oxidation and discoloration, even in humidity. 16” dia. collar necklace easily slides on and off. Polish with a soft, dry cloth. Allow 2–3 weeks for delivery.